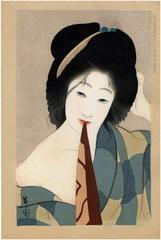 Shima Seien (島成園: 1892-1970) was one of those rare Japanese print artists, a woman. The first edition was published in 1924. There was another edition in 1932. A bust portrait of a semi-naked young woman of the Showa era gazing mistily to the right as she adjusts her coiffure. The example in the Lyon Collection is said to be from the 1924 edition. There is one in the Greater Art Gallery of Victoria which is said to be from the 1932 edition. It is not illustrated online. Illustrated in 近代日本美人画展 : 伝統木版画を支えた作家たち Exhibition of Modern Japanese Beauties: Meiji, Taishō, Shōwa, Riccar Art Museum, 1982, n.p., no. 77.